Proprietary Name: Heb Ultra Strength Assorted Fruits What is the Proprietary Name? 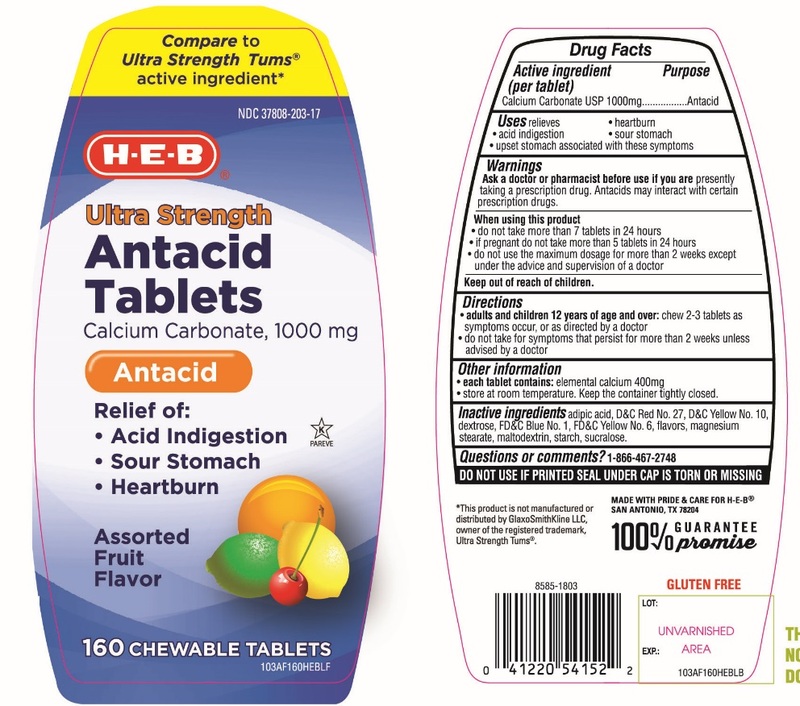 Heb Ultra Strength Assorted Fruits with NDC 37808-203 is a a human over the counter drug product labeled by Heb. The generic name of Heb Ultra Strength Assorted Fruits is calcium carbonate. The product's dosage form is tablet, chewable and is administered via oral form. Ask a doctor or pharmacist before use if you are presently taking a prescription drug. Antacids may interact with certain prescription drugs.When using this product •do not take more than 7 tablets in 24 hours •if pregnant do not take more than 5 tablets in 24 hours •do not use the maximum dosage for more than 2 weeks except under the advice and supervision of a doctor. Adipic acid, D&C Red No. 27, D&C Yellow No. 10, dextrose, FD&C Blue No. 1, FD&C Yellow No. 6, flavor, magnesium stearate, maltodextrin, starch, sucralose.